The rains have resumed, and with them some flooding. If not in the streets, then at least in some old, fairly porous homes. San Miguel de Allende is, after all, an old, old, colonial city, and the heavy rains here in the central mountains of Mexico have a way of flowing in. Take my bathroom, for instance. It has a tendency to leak and flood when it rains. Rain sprinkles through the brick ceiling and flows slowly down the walls. My towels and bath mats get drenched. I throw up my hands and report the issue to the very able management, and I’m assured the problem will be resolved “pronto” (soon). I do a quick reality check: This is Mexico. I am not a princess. I learned some of the mysteries of cultural adaptation in the Peace Corps in Africa twenty years ago. The pluses of life now in San Miguel far outweigh the minuses on a daily basis. I am a grateful — and legal — resident here. Most of all, I know things could be much worse for me: I could be a refugee. I’ve been thinking a lot about refugees lately, especially since seeing the brilliant 2017 documentary film by the exiled Chinese conceptual artist Ai Weiwei, “Human Flow,” last Saturday night with my friend and neighbor, Iris. This haunting film visits over twenty countries during the space of one year to expose the reality on the ground for these desperate men, women, and children who’ve fled their war-torn homelands, driven by the hope of finding asylum in another country, only to discover — in too many cases — razor wire at the other end. Or, as one New York Times journalist poetically described it, “millions of refugees shipwrecked between the wasteland of home and the void of exile” (Vivian Yee, 8/9/18). The film relates to Weiwei’s personal life in that he was forced out of Beijing with his family as a young child during China’s Cultural Revolution. As a result, he has been open about his own dehumanizing experience of living in a Chinese camp under terrible conditions. Using various technologies – including drones, cameras, and iPhones – the film’s artistry is breathtaking. Weiwei’s camera lingers on scenes that come to resemble landscape paintings of ominous terrain, and his shots of individual refugees staring directly at the camera look like portraits of despair. We’re given time to see in those faces our shared humanity, as if looking into a mirror. We stare back and think, That could be me. Ai Weiwei’s purpose in making this film, clearly, was not to offer easy solutions to this immense and heartbreaking humanitarian crisis but rather to raise consciousness, to open minds and hearts, and to inspire empathy and compassion. One cannot watch “Human Flow” without being moved by it. That’s the purpose of art, I feel, to reach people viscerally, to get at them where mere news accounts can’t reach. “I know very well that things could be so much worse. I could be a homeless, stateless refugee living, however temporarily, in a flimsy tent on the border between the country I was escaping and the country that was barring my entry. I could be cold and wet in weather that won’t stop raining, unable to wash clothes or bedding in clean water and hang them in the sun to dry because there’s no available clean water, no line to hang them on, and not even a glimmer of sunshine. Those of us who sleep in clean, warm, dry beds in countries that embrace us – whether our countries of origin or our adopted countries — have a responsibility, I believe, to feel and demonstrate compassion for the many millions of our fellow human beings who are suffering in such dire straits. We must look reality in the face and do whatever is within our power and talents to become part of a global solution. Seeing “Human Flow” may well be a good first step in that direction. Note: “Human Flow” will be shown here in SMA on Thursday, August 16th at 5 pm at El Sindicato Cultural Center (Recreo 4), sponsored by Caminamos Juntos; a discussion of the film will follow. Also: I highly recommend two new nonfiction books about the refugee crisis in Greece – Kim Malcolm’s A Country Within, and Sallie Latch’s Hear Me. Thank you for this review Bonnie. It is an important film, reminding us that refugees are people running from war (many conducted or supported by the US) and terror, and deserving of our global support and understanding. Thanks for the reminder. We get caught up in our tiny lives and need to be awakened to the needs of less fortunate people who are just trying to survive! Yes, Kate. I fear we’re all getting a little numb to all the horror stories swirling around in the news. But this film, I feel, is both eye-opening and heart-opening. Well worth seeing! I definitely think you should leave the umbrella where it is, Bonnie. 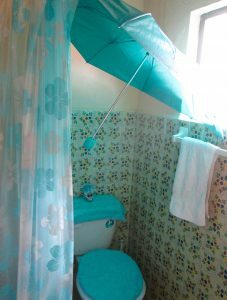 It’s such an enchanting bathroom accessory! I like the peacock blue (bleu des mers du sud) color of your wet bathroom… Yes , we must be thankfull for our lives and think of others! Oh, THIS review. Well,I bought a ticket (because of you) and will go to the movie. Which I might never have done if you hadn’t talked about it. Quite frankly, I thought the folks who responded to your most recent WOW could have dug a little deeper. Can’t wait to hear what you think of the film, Helaine. I look forward to a full report next time we have lunch together — pronto, espero. I hope all Americans are thinking about refugees right now and reacting in outrage over what is happening at the border. I’m sorry you had a leak in your bathroom. The fact that things could be much worse doesn’t always provide the comfort it appears to offer. I’m going to look for the film. Bonnie, thank you for your awareness, your compassion and your willingness to spread the word. I am honored to know you.